Shirley from my CCEE group gave us a terrific sketch challenge this week. 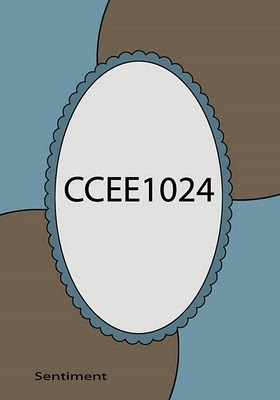 If you'd like to play along with us, please visit our CCEE blog to get all the details. You can also see the fab projects my team mates Cindy, Joanne, Shirley, and Frances designed. For my card, I silver embossed and watercolored with Basic Gray reinker this terrific horse image from Out West by Gina K. on Gina's Pure Luxury White cardstock. I then cut him out and adhered him with dimensionals. I think he looks majestic; therefore, his name! I'm thinking about using this for a swap I'm going to be participating in. We have to create half masculine and half feminine cards. Obviously, this is a masculine theme. I'd just seen this on the CCEE blog. Majestic - it's downright magnificent. I just love that colour palette, and the little star and lasso couldn't be more perfect. Charlene, this is magnificent!!! The colors, your beautifully colored image and design are amazing. Charlene, this is just a beautiful Masculine card! the striped paper is fab, and so is that image! Great job, GF! This is gorgeous, or what's a good word for a really neat horse-card?? Words escape me...but truly a winner, and looks like a lot of effort for a swap but I'm sure it would be so sought after!! Have fun at the swap...sounds great, Charlene! Charlene, I love your majestic horse. I would never have thought of silver embossing a horse, but think I will in the future, not that I have seen this beauty. I think it will work for the swap, it has a masculine look, but the silver embossing gives it a softer look so I can see where this could be for a women, as well. Your swap group will love it.